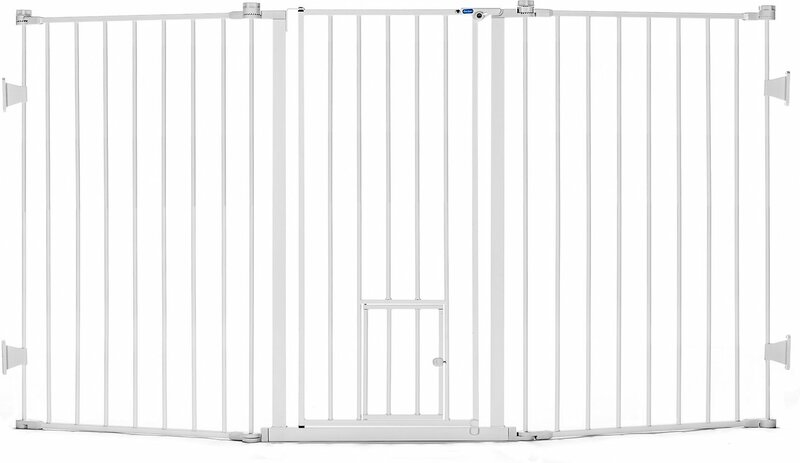 The 38-inch height makes the Carlson Pet Products Flexi Extra Tall Walk-Thru Gate with Pet Door great for large pets while also having the ability to span a 76 inches opening or be configured to fit unusually shaped or angled openings. Can expand to an incredible 13 feet wide with the use of additional 24 inches extensions. Hinged posts offer an amazing variety of gate shape possibilities. 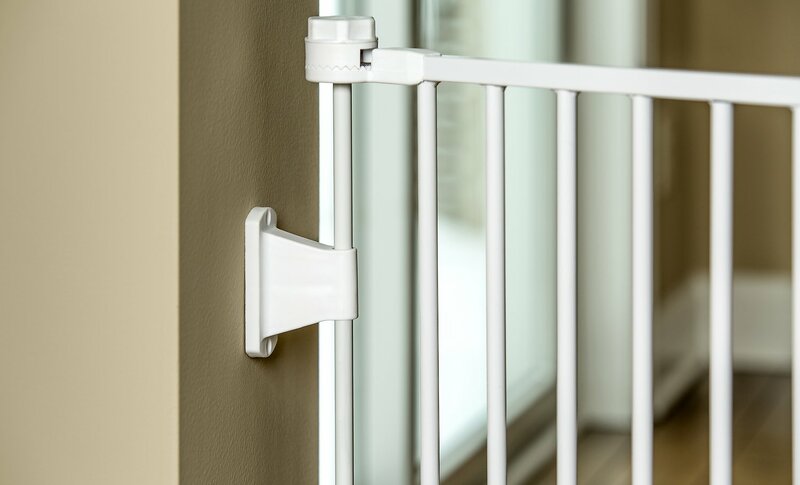 Convenient walk-through design has an easy, one-touch release handle. Patented pet door is 10 inches by 7 inches to let small pets pass through, while everyone else stays put. The 38-inch height makes this gate great for large pets while also having the ability to span a 76 inches opening or be configured to fit unusually shaped or angled openings. Convenient walk-through design has an easy, one-touch release handle. Patented pet door is 10 inches by 7 inches to let small pets pass through, while everyone else stays put. 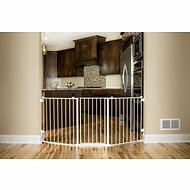 (1) Carlson Extra Tall Flexi pet gate, instruction manual, (8) screws, (4) wall mounting brackets. NOT recommended for use with children. Install according to manufacturer’s manufactures instructions. ALWAYS install and use [gate/enclosures] as directed using all required parts. STOP using when a child or pet can climb over or dislodge the gate. Use only with the locking/latching mechanism securely engaged. To prevent falls, NEVER use at top of stairs. NEVER use to keep child or pet away from pool. This is a Pet Gate, but when used with children, the small pet door must remain closed and securely latched. Strangulation hazard: pets can force themselves into very small openings; use this gate with pets whose heads will not fit into openings in the gate, between the gate and floor, or between the gate and wall. NEVER leave child or pet unattended. Check the gate regularly to see if all the hardware and mountings are tightened. Do not use if any components are missing or damaged. Adult assembly required. The gate is 38 x 76 inches with a 10 x 7 inch pet door. Periodically check the gate for signs of damage, wear, or missing components. Do not use if any part is missing, worn or damaged. Check the gate regularly to ensure all the hardware and mountings are tightened. Do not use abrasive cleaners or bleach. Clean by sponging with warm water and a mild detergent. Unfold the gate frame by turning the locking knobs counter clockwise at each pivoting joint. Loosen the knobs enough to allow the gate to swing open freely without fully removing the knobs. Use a Phillips/cross-head screwdriver to fix the wall mounting bracket to the wall. Repeat for all 4 brackets. Arrange the panels to your desired configuration, then tighten all 4 of the locking knobs. I have a very wide archway that I had wanted to put a gate on for quite some time. This gate works perfectly there! It's extra wide, extra tall and has a small door on the bottom for my kitties to go through if I wish. I have the gate on my sunroom, which has birds in it that I occasionally let out to stroll around in the room and this gate keeps them in that room. The only drawback was in getting the mounting brackets on the wall. You have to unscrew the side posts and remove them first or you can't get a screwdriver on the screw tops. But other than that, it's a great gate! Amazing price for this gate!!! Really a great gate. It is unfortunate it has to be screwed into the wall, however it is worth it to keep your dogs from chewing furniture in rooms you don't want them in! 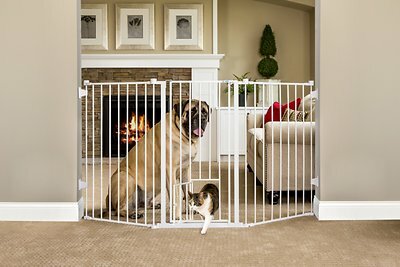 The smaller gate within the entire gate is great for cats or small dogs. Love it and love this amazing brand!! I have had many gates over the years and this is the best one I have ever purchased. Easy to assemble and put in place. Reasonable price. My 38 lb puppy jumps on it and cannot knock it over. It barely moves when she does. The cat door is a bit big so I cannot use it because the dog can still fit through it since she is long and slender. Gate is very sturdy. No one has ever complained that it was an inconvenience. Everyone appreciates it. First, my gate arrived damaged with one bar bent. The gate is rather flimsy and so latching poorly. Partly, maybe due to the bar next to the door being damaged. When my dog leans against it, it pops open. I like the height as I have an Itish wolfhound puppy. This gate gets the job done for my 30lb dog, but she doesn't try jumping against it or anything. We ordered this thinking it came with extensions in case we needed it, but then found out they are apparently not available anywhere at all, so that's very unfortunate. We can't really use it for what we intended, but oh well. The lock is also a little annoying to me, and I wish the door shut automatically when you walked through it. My small dog is 30lbs and can fit through the tiny door just fyi. If it came with the extensions, then we would be happy with it. Unfortunately this gate is not working for us, we recently adopted a dog who is turning out to not be cat friendly. We hoped this gate would prevent him from chasing the cat, but it is not sturdy enough and he breaks right through it. Great height. The gate is easy enough for humans but sturdy enough to keep our lab mix where she needs to stay . Easy install and nice flex fit for awkward sized doorways!